If you have any questions or suggestions you are welcome to join our forum discussion about What Defines a Strong Trend. Strong trends are easily spotted and you will definitely know one when you see it. When you look in retrospect, strong trends tend to extend from the bottom left part of your computer screen to the top right corner if it’s a bull trend and vice versa. Here is an example of a strong bear trend. What is important when it comes to strong trends is being able to determine as early as possible that the market will be moving for a protracted period in a single direction. This would allow you to hop on the trend and ride it for longer, thus, maximizing your profits. In the current article we will speak about the different characteristics that define a strong trend and also give a general insight on what to do during one, and later on we will discuss more thoroughly how to trade a strong trend. So let us begin. As we have mentioned before, the fact itself that the market is showing strong directional movement can be a sole reason to enter a with-trend position at least with a small portion of your usual size. The more signs of a strong and sustainable trend are at hand, the more you should focus on with-trend positioning. As soon as you have determined that you are in the middle of a strong trend, you do not really need to look for a good or perfect setup, you can enter anytime with a relatively tight stop. Setups can only further reduce the risk. Generally, strong and protracted trends rarely provide great with-trend signals, causing the market to be constantly chased by market players, which itself makes it grind higher. In fact, during strong trends the most clear signals with best reversal bars are actually counter-trend, trapping traders who thought the strong trend has finally come to an end. 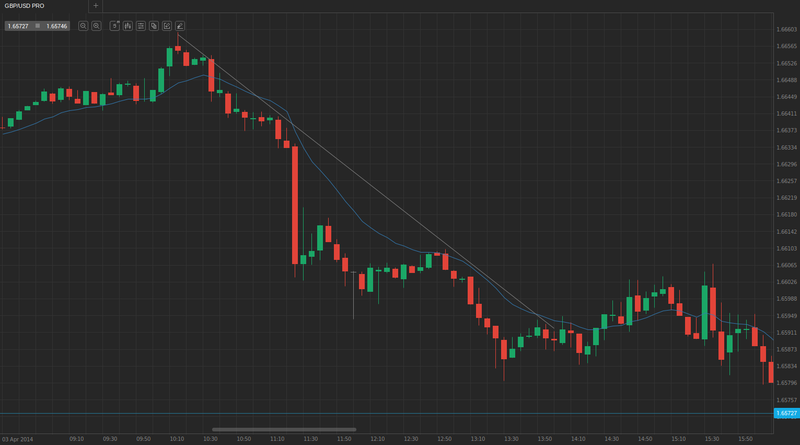 This is why you should focus on with-trend entries and switch to counter-trend ones only after the market begins to produce great with-trend entries, a sign that it may as well reverse soon due to its exhaustion. There is a certain number of characteristics strong trends have, whose occurrence will allow us to position on-time. First of all, like each other trend, strong trends must have trending highs and lows. Moreover, as the trend is progressing, it will clearly be forming more with-trend bars than counter-trend ones. Very often you will see strong trends displaying a sequence of 15 and more bars that haven’t touched the moving average. Additionally, if there is a penetration of the moving average, you will not see two or more consecutive closes beyond the MA (on its opposite side). Such an example is illustrated below. Due to their length, strong trends tend to break several resistance or support levels by many ticks, including trend lines, moving averages and previous swing highs or lows. Also worth taking into consideration is that in order for a strong trend to be sustainable and last longer, it should not be showing climactic behavior, which means that its bars should be of smaller size and gradually ascending. As the trend grinds higher, there will be little overlap between the bars, meaning that, in a bullish trend for example, each bar opens at or only several ticks below the previous bar’s high. This signals that market players are chasing the market and are urgent to buy, because they are sure that the price will continue to edge higher with the next bar and they want to buy as lower as possible. This results in the formation of wickless bars (shaved) and double-wickless bars. Sometimes the trend will begin with a large trend bar, but as we said, long trends tend to lack big with-trend bars during their run. Instead, often the largest bars are counter-trend, trapping traders who thought the market might be reversing. Counter-trend trades during strong trends are very hard to achieve and basically nearly impossible for novice traders to profit from. An additional sign of strength is a gap between two bars, which are separated by a strong trend bar – the close of the previous bar is below the open of the following bar. Moreover, because the market is steadily ascending and not showing climactic behavior, there will be only minor trend channel line overshoots that will result in sideways corrections. In a similar way trend line breaks do not result in counter-trend movement, rather sideways. Spikes against the trend commonly have no follow-through, thus, are deemed failed, and become with-trend flags. 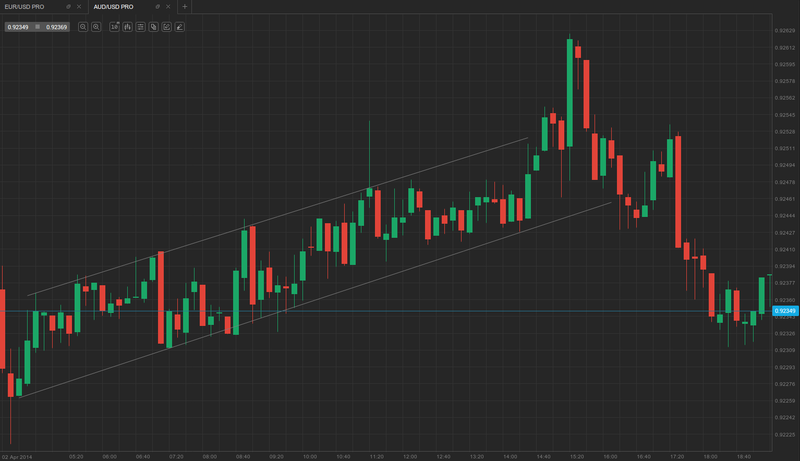 Here is an example of a steadily ascending trend channel. Pullbacks are rarely seen during strong trends and they are shallow and mostly sideways as well. Their depth usually does not exceed 15%-25% of the price’s daily range and will often occur not more frequently than once every 5-6 bars or more infrequently. Market players are waiting for good pullback setups in order to enter the market, but they generally have weak signal bars. In a bull trend for example, the signal bars for a higher high long entry are the lows of bear bars that have formed a small 2-3 bar pullback. 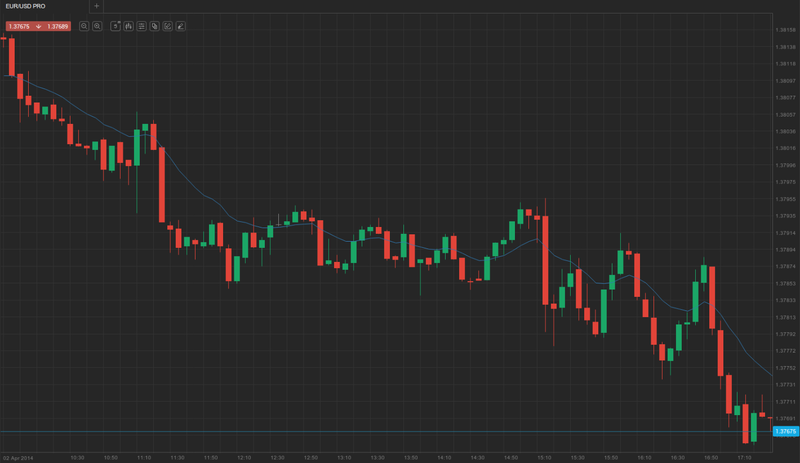 Repeated two-legged pullbacks are very often regarded as with-trend entries.